Announced for consoles back in December, the hack'n slash from Haemimont Games is heading to PS4 and Xbox One with two expansions: Fractured Worlds and Motörhead Through the Ages. 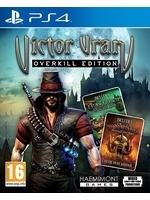 Victor Vran: Overkill Edition is also coming to PC and players who own the game already will be able to buy the DLCs separately. Get a first look at the new content with the screens and gameplay videos inside.